Alex Row, captain, Sophia, commander, and the dread-ship Sylvana. 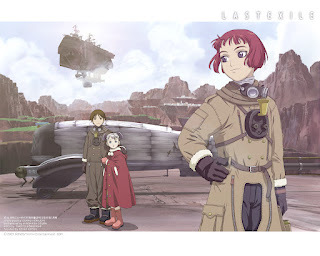 Claus Valca, vanship pilot, Lavie Head, navigator, and Alvis Hamilton, scared child and key. Tatiana, ace pilot, very serious. 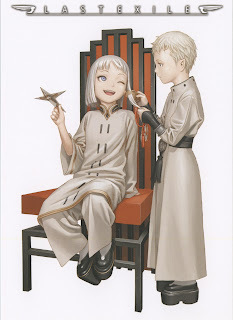 Dio and Lucciola, members of the Guild. Slightly inhuman, very elegant. 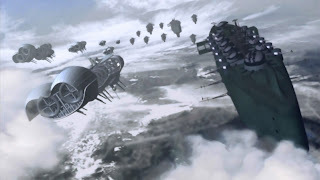 Here are airships from the countries Disith and Anatoray. They're embroiled in a terrible war over land resources. Each country is undergoing its own climatic changes, with Disith covered in everlasting winter, and Anatoray perpetual drought. Water and wheat are becoming rare and valuable, and due to political missteps and the Grand Stream, war has begun. 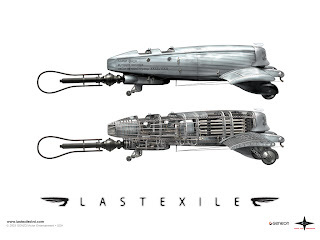 Last Exile is one of my favourite anime. Above is the opening video and a variety of images of key people and elements. The setting is the sky. 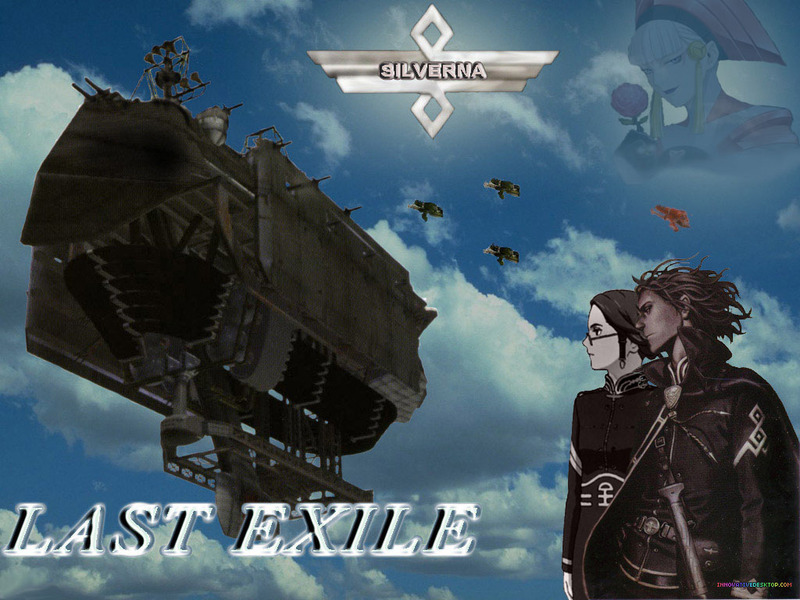 The first image shows Alexander Row and Sophia Forrester, the captain and the commander of the Sylvana. Alex Row is an easily romanticised character. He is intelligent, competent, quiet, and has a past you can sympathise with if you can find out what it is. Sophia is a lubricant for Alex in interacting with the others. 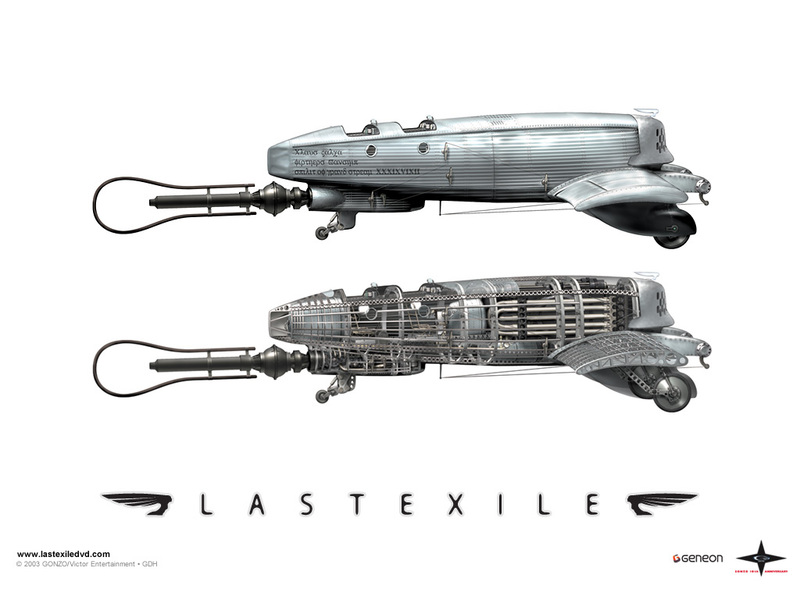 Together they command the Sylvana, a dangerous ship with a terrifying reputation. The Sylvana operates independently of nations but with determination and definite purpose. I admire Alex Row easily, even though he captains an efficient killing machine. It's similar to the respect I can hold for certain military officers despite reviling war. When you're in a difficult situation and your options are reduced to protecting those you care about by exercising your own power over others, or let them suffer and die. Alex's motivations are a bit different. But a blossoming commander in Ender's Game helps exemplify that motivation a bit better. There's a problem with that, where the idea that force is the only remaining option is incorrect. When there are alternatives, but they're just not obvious. It's hard to completely blame someone for inadequate imagination, it's just sad. Even if force was somehow the only option, it's still sad. In real life, it feels like force is almost never the last resort. It feels strange how military service has often been held in high estimation, though I understand it. It's interesting how literature makes me feel as though it used to be esteemed higher before and receives greater derision today. Though, in reality, I think that respect and criticism are still similarly distributed now as it has been previously. Still, there are qualities in Alex Row that I'd like to adopt. Especially his composure, contemplation, deliberation, reliability, and admirability. Claus and Lavie are delightful. They're ambitious children growing up in relative poverty with a passion for the sky and good hearts. They just want to fly. They pursue their passion and apply their talents wholeheartedly, and they're willing to use them to help others, regardless of the inconvenience to themselves. Tatiana is a bit like them, but much more serious about it. I used to be much more serious about things, but I've relaxed a bit. I still admire her dedication to her skills. I try to think about people like this when I work on things like iaido and programming. Dio and Lucciola are cute when they're children, and almost terrifying when they're grown up. They are elegant and beautiful and loyal and refined. I used to seek refinement more, but let's be serious, a lot of refinement is arbitrary and reflects artificial divisions between us and them. Create rules and practise abiding them to distinguish oneself. There are tangible benefits to many such rules, and the result can often be elegant and beautiful like Dio and Lucciola, but for my life, it's not worth the non-financial expense. I just want to appreciate everything. I like playing at elegance, dressing up for outings, etc., but only as long as my companions and I know it's for fun. Disith and Anatoray's situations are quite tragic. A lost communique fails to prevent war and humanity's limitations lead them into bloodshed. Beautiful, majestic ships wield technology towards mass death. People with homes and families sail forward to their deaths and the destruction of happiness and home. Vanships are cute. They're personal, tiny aircraft that are very nimble and give freedom to their pilots. They're like my computer and my programming, or like my sword and my iaido. I adore the art, the music, and much of the culture in the world, but I've written enough for now. 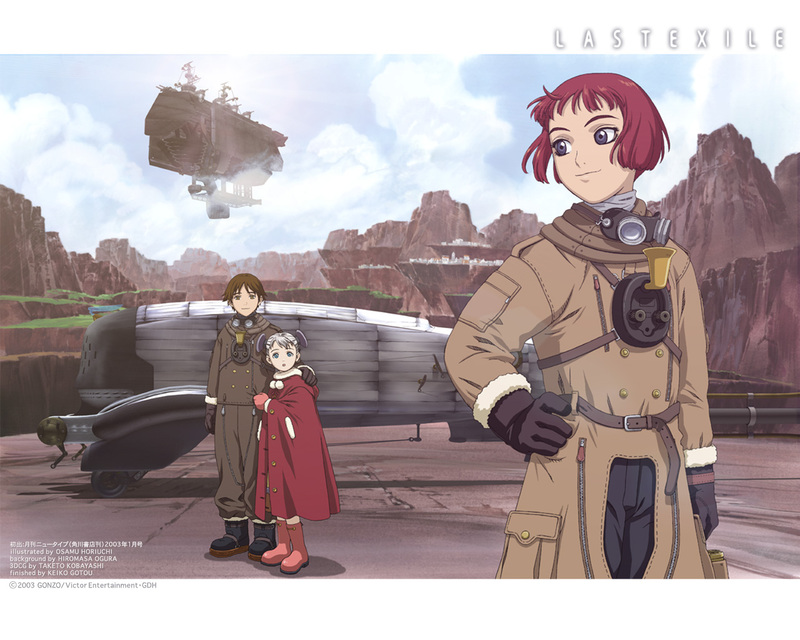 At the top is the intro to the series, which depicts much of the struggle. Now is the outro, which depicts more of the humanity.